After a third Republican debate that left many of the candidates disputing over the debate format itself, the fourth event will surely be a must-watch. The fourth GOP debate will be hosted by Fox Business and The Wall Street Journal and is scheduled to take place on Tuesday, Nov. 10, live from the Milwaukee Theater in Milwaukee, Wisconsin. Those watching at home are wondering one crucial thing: will the fourth Republican debate only be on Fox Business Network? As of now, that is the only channel airing it — but Fox Business is offering a free live-stream service on its website for the duration of the debate, so you can watch whether or not you have cable. Last month, Fox Business Network announced that it would host the fourth Republican debate in partnership with The Wall Street Journal. In its announcement, the network revealed that the debate would focus on economic issues, such as "jobs, taxes, and the general health of the economy." Last Tuesday, Fox Business announced the format, criteria, and moderators for the upcoming debate. Like the last three debates, the fourth event will include an undercard debate in addition to the primetime one. The criterion for stepping onto the first stage is at least one percent in at least one of the four polls recognized by Fox Business, conducted through Nov. 4. 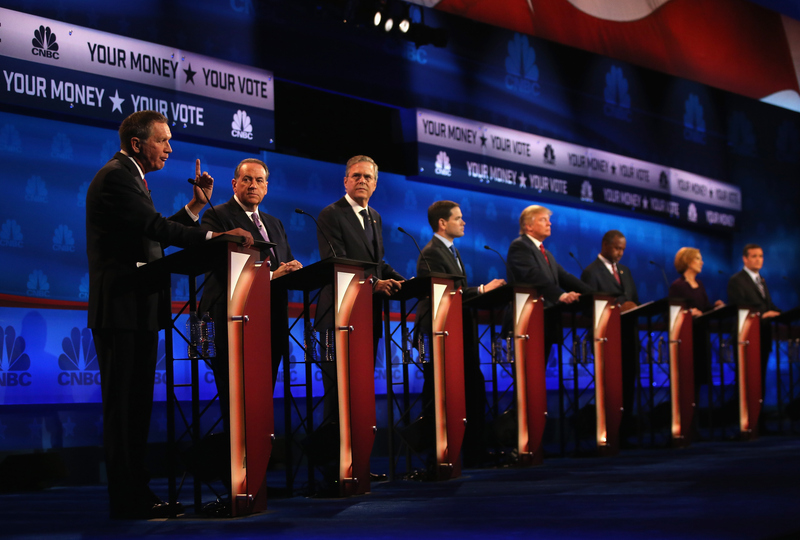 The requirement for partaking in the main debate is at least 2.5 percent in the same polls. But where will the event be aired? Fox Business's GOP debate, which will be moderated by Fox Business Managing Editor Neil Cavuto and Global Markets editor Maria Bartiromo, as well as Wall Street Journal Editor-in-Chief Gerard Baker, will be broadcast live on Fox Business Network and FoxBusiness.com starting at 9 p.m. ET. The undercard event, which will be moderated by Fox Business' reporters Sandra Smith and Trish Regan and Wall Street Journal Washington bureau chief Gerald Seib, will also air on Fox Business Network and FoxBusiness.com starting at 7 p.m. ET. However, coverage will begin on Fox Business Network at 5 p.m. ET with a special debate-focused Lou Dobbs Tonight, which will return again after the undercard event until the primetime event starts at 9 p.m..
With all the drama and growing fractures in the Republican primary field, the fourth GOP debate should prove to be quite interesting. In case Fox Business pulls a CNBC and requires you to have a cable login, you better start being nice to all your cable-equipped friends now.